The island of Puerto Rico woke up this morning to 81 drug-and-gun-related arrests. One of them was even a minor league baseball player. The police conducted raids in 6 different cities. The numbers for the city of Ponce come in as follows: 14 arrests, 6 seized vehicles, 31 grams of cocaine, and 3.4 pounds of pot. Plus five handguns, an AK-47, and a submachine gun which were bought by an undercover agent during one of the raids. That’s it??? 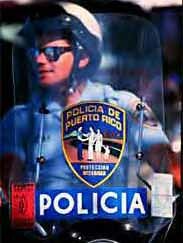 It’s sad that the corruption-filled Puerto Rican police organization is so involved in the world of gun and drug trafficking that they can walk away from an island-wide raid with so little in terms of seizures, while at the same time managing to rack up an unbelievable $24,905,000.00 in bail money. I guess they need to get money any way they can. I visited PR recently and that definitely jives with the way that everything government-related is now more expensive. What xenophobic pigs they are. Whether or not a set of sub-titles was taken from a DVD would be slightly difficult to prove since accurate movie sub-titles SHOULD BE INDISTINGUISHABLE from what is included on a sub-titled DVD. I’m not sure how liable WikiSubtitles would be for something submitted by one of their users. Then again, I’m not sure what the legality of any of this would be like in Spain. Finally, anybody that keeps cute little deaf Filipino children from enjoying Dora The Explorer in Tagalog is an agent of evil, in my opinion. This entry was posted on May 20, 2008 at 8:13 pm and is filed under Anger, Filesharing, On My Radar, Puerto Rico, Technology. You can follow any responses to this entry through the RSS 2.0 feed. You can leave a response, or trackback from your own site. I wonder if you can help me. I am looking for the mailing address and phone number for the police department in Rio Grande, PR.